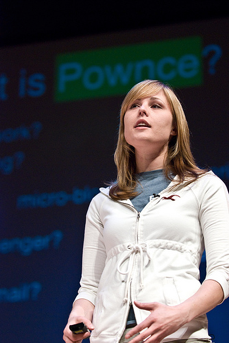 In December 2008, Six Apart acquired Pownce, a microblogging service that never managed to attract a large following. Pownce was shuttered after the acquisition, but its two-person team joined Six Apart to help integrate the technology into Six Apart’s blogging services. Today Pownce founder Leah Culver has written on her blog that she’s leaving Six Apart, where she spent the last year working on its TypePad and TypePad Motion products. Culver writes that her next project is developing an iPhone application for Plancast. Despite reports to the contrary, Culver isn’t joining Plancast full time (at least not yet). Plancast founder (and TechCrunch alum) Mark Hendrickson says that she’s joining on a contract basis to build the iPhone app, but that the long-term future is uncertain. Culver’s blog notes that she might continue working on Leafy Chat, a web based IRC client that’s in private beta. One thing worth pointing out: Culver and Mike Malone were Pownce’s only engineers, and they were absorbed into the Six Apart team as part of the acquisition. Malone left Six Apart just over a year after the acquisition to join SimpleGeo, and now Culver has left just a few months later. It looks like they had a one-year post acquisition cliff, and given their departures soon thereafter, it’s possible the integration of Pownce’s technology didn’t work out as they might have hoped.